Two weeks into its soft launch/open beta, Cryptic's Neverwinter Online is a surprise bucket of fun, despite the missing ranger class. I’d been hearing rumblings, like the distant pounding of hooves, for weeks before I got the notice in my inbox about Neverwinter Online‘s soft launch / open beta. Having heard good things to that point (as I wasn’t able to secure a beta key to see for myself), I decided to have a look. After all, it was free and I had some time on launch day. 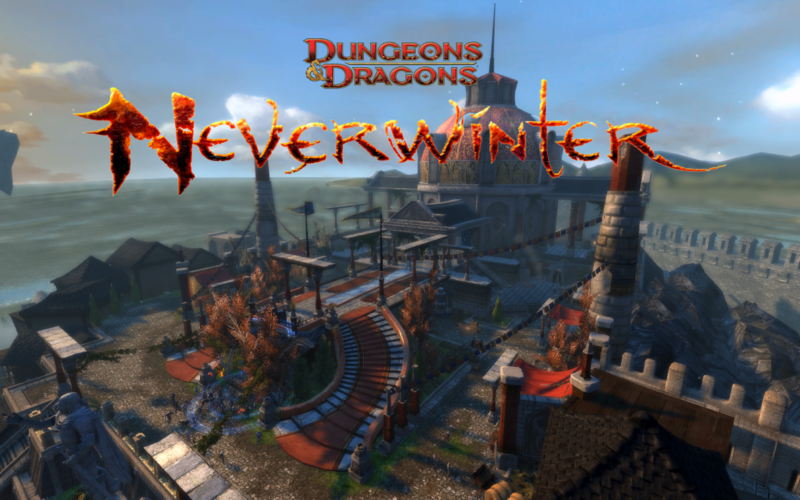 I got my start as a gamer with Pen & Paper RPGs, specifically the original purple boxed set of D&D (pre-AD&D), so I was really looking forward to what I might find in Neverwinter Online. Admittedly I have little experience with the Forgotten Realms, as the play group I was most recently involved with (many years ago) spent most of its time in Krynn (where my Dragonlance peeps at). D&D, however, has its own feel, and after two weeks of play I can say without reservation that Neverwinter Online has that feel. D&D, at its heart, is about crawling around in musty old dungeons, caverns, catacombs, and tombs. You might have started out in some tavern or had the occasional wilderness type quest, but it was all leading you somewhere indoors and likely underground. 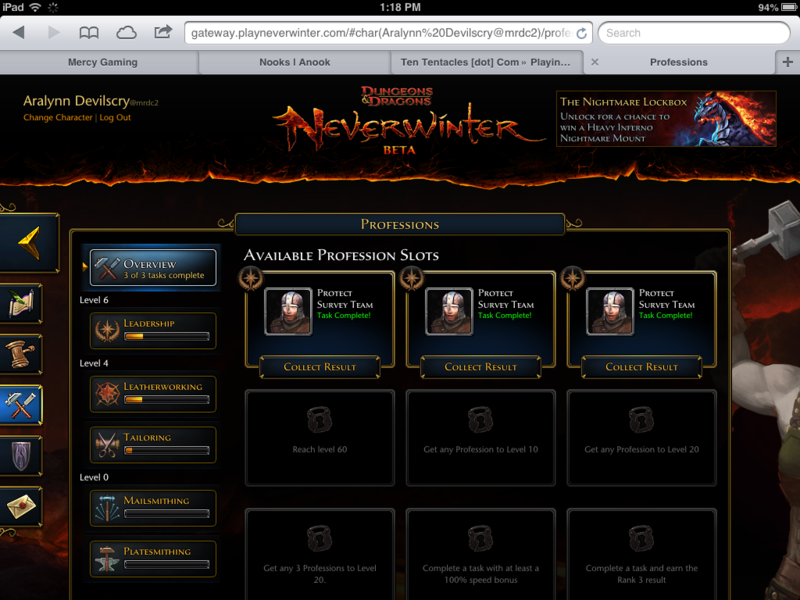 Neverwinter Online has that in spades. It’s the same feeling, and it really brought me back to those pizza fueled days around a card table in someone’s rec room, hacking away at goblins and ogres. The combat is simple, clean, and uncluttered. There are a multitude of skills available, but you can only have a handful equipped at any one time. This gives you some situational customization, but also keeps your action bar to a manageable size. From there it’s just a matter of clicking on what you want to kill, much like Blizzard’s Diablo series. Add in an active dodge, and it all feels really fast paced and dynamic as you dash and hop around enemies, laying waste in a wide variety of locales. The zones themselves are really beautiful. In the two weeks I’ve been playing I’ve seen cobweb infested caverns, dark, dusty tombs, misty forests, chilling graveyards, and bustling cities. The style and color palette lean toward the cartoonish side, but it is all really well put together, giving you the feel of a cohesive world as the main story leads you from place to place. The main story is, however, mediocre. It does serve its purpose of guiding you through the available zones at the appropriate levels, but does little to actually engage me and make me care about any of the NPCs I talk to. This sadly includes the party level dungeons. They’re nice, but there’s nothing new or exciting in them. Where content really shines, though, is in the Foundry. 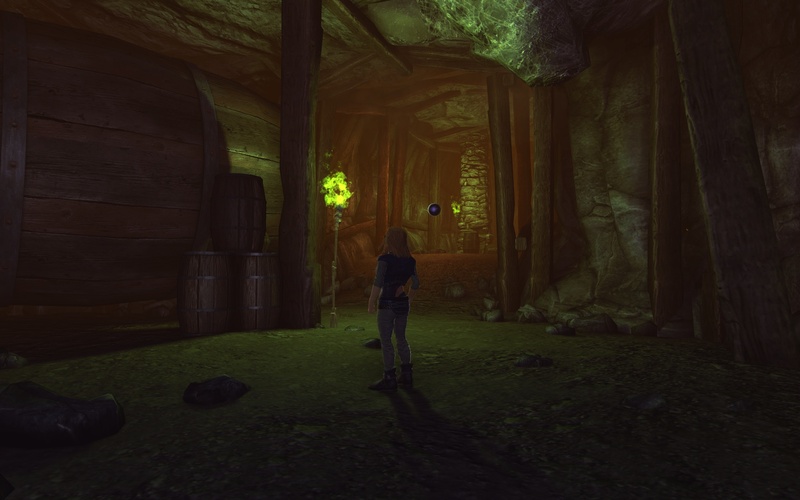 Much like Star Trek Online‘s Foundry, it is a library of player generated quests you can play through to earn the same sorts of rewards, in XP, currency, and drops as you would playing through the Cryptic generated content. The promise here is that end-game, while likely still a grind, wouldn’t be a monotonous one. There will always be new adventures to play. Crafting is handled with a unique system of hired crafters, much in the way Duty Officers in Star Trek Online work; you hire crafters to gather mats, do related quests, and craft items. The real bonus is that you can manage all this through the Neverwinter Gateway, a web interface that works whether you’re logged into the game or not. I’ve been managing all of my crafting on my iPad Mini, from my easy chair while watching TV. You can also check your in-game mail, view guild info, and view your character sheet from the same interface. 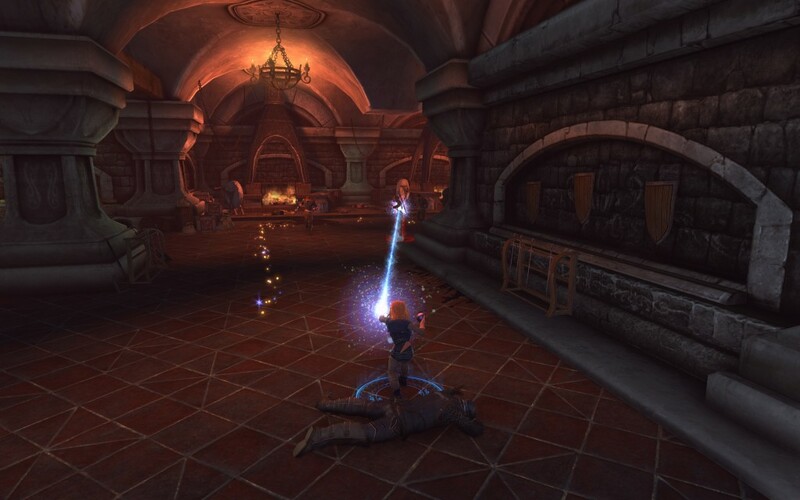 Neverwinter Online is not perfect, however. While it is F2P, there are surprising limitations in comparison to other F2P titles, including Cryptic‘s own Star Trek Online. For example, bag and bank space are painfully limited to the F2P player, and to increase it in any real sense requires the expenditure of real money. You do get a few bags as main quest rewards, but they are tiny and spread far apart. Bank space is almost non-existant and can only be increased with unlocks from the store. Which is a shame because the crafting system needs a lot of space. The game also launched without a Ranger (ranged bow) class. I’m not sure of the reasoning behind this, but this struck me as odd and was a personal disappointment as this is the class I typically play. There are bow wielding NPCs and mobs, so again, I’m unsure why the playable class is absent. Along those same lines, the Drow are missing as a playable race. This is more of a nitpick on my part because I really like Drow, but given that it is the Forgotten Realms, this also seemed like an odd oversight. Finally the biggest disappointment for me, especially considering the level of character customization available in Star Trek Online, was the lack there of in Neverwinter Online. Character creation has all kinds of sliders and choices, but the armor sets and clothing available feel more like a legacy MMO (*cough* WoW *cough*). Once in the game, the most you can do to that armor and clothing is dye them different colors. This is done with dye pots, instead of a built in color switching interface (once again, like STO), and I have yet to discover where you get more. In short, you spend hours tweaking your look in character creation, only to have it all hidden under armor sets that look like every other Trickster Rogue or Control Wizard, or whatever. All in all, though, these few failings aren’t even close enough to make me stop playing Neverwinter Online. Most of them are things I hope to see added or changed as the game matures and leaves beta. The game play itself is fun and engaging and easily playable without spending a dime. 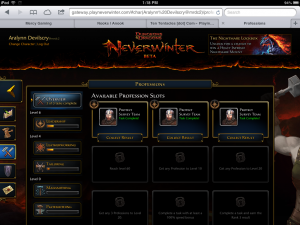 I highly recommend Neverwinter Online. After all, you’ve got nothing to lose but time to give it a try. 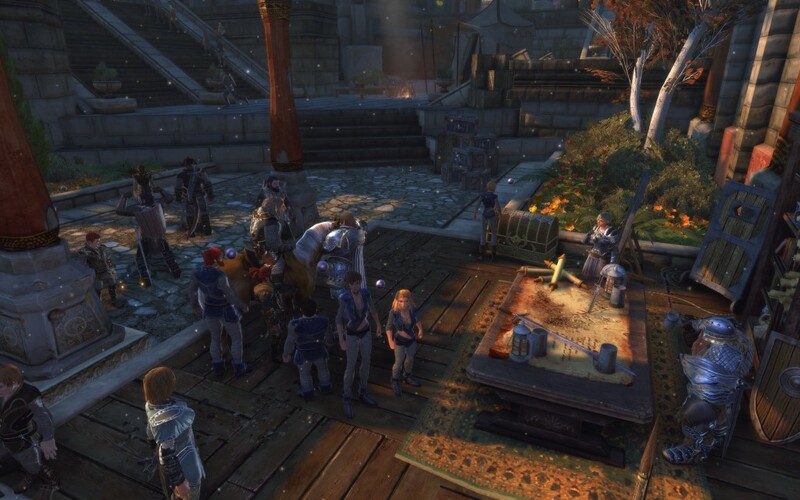 I have really enjoyed playing Neverwinter. My only problem is that I’ve had TONS of connection issues with it. However, that may be my cable modem/router. I’m going to have to call TWC about it anyway. Until I can do that, I’ve stopped playing temporarily. That said, once my issues are resolved, I do plan to try again. What I did play was just FUN. Are there prettier games? Yes. Are there better games? Yes. However, I haven’t found anything that’s any more fun. Especially at the low, low price of free. In an only mildly related note, I did not, however, enjoy Marvel Heroes in an open beta. I didn’t find it to be particularly visually compelling and the gameplay was kind of stagnant and flat. I did not however have lag or connection issues. If I could get the connectivity at Neverwinter that I got with Marvel Heroes, I’d be entirely happy to just play Neverwinter. Much more compelling game play. In terms of fun level, I don’t think I’ve played an MMO that was any more fun than Neverwinter. Totally agree with you on both counts (Neverwinter and Marvel Heroes). 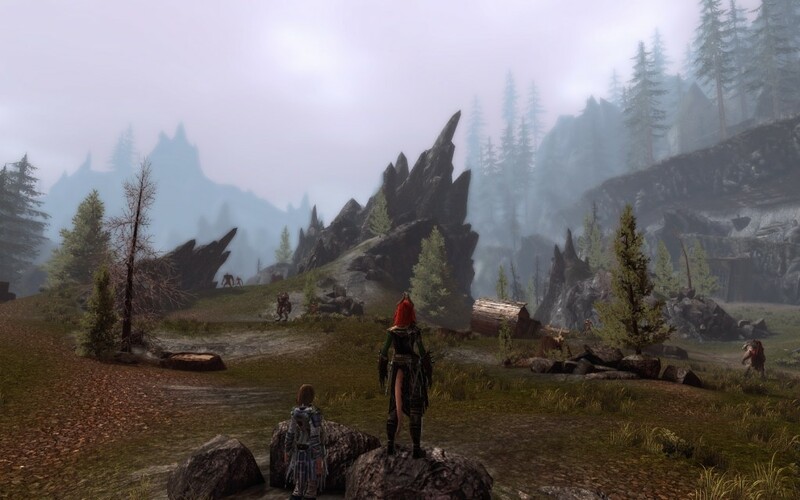 The connection issues might be related to just the fact that Neverwinter is still technically in Beta. They’ve pretty much had maintenance every day resolving many issues related to connectivity. In many cases I think it was load on their network, as it also affected their other game, Star Trek Online. Marvel-ous review. I personally found the game to be too quick in leveling (I know, why complain?). I was at level 60 before I knew it and I didn’t even binge play (much). Between PVP, story line, foundry, random killing, crafting, and god worship I had reached the max before my crafting had time to catch up. As an experiment I have one of my two free slotted characters just leveling with blessings and crafting. I am weird that way. Still playing though, with the release of the Feywild extension and the timing of summer festival I have new Hi-ho to go.